© 2002. Clothbound, (5.5" X 8.5") 128 pages. A great number of Peggy Lyles poems frame rich and timeless fragments of life, depicting moments that are the precious heritage of generation after generation. Often, when I read Peggys haiku, time seems to stand still in a scene that will be as true tomorrow as it was a hundred years ago. The act of snapping beans in the company of women has therapeutic value that cannot be found in any pill. Women know this. On the porch or in a sunny kitchen, we accomplish this satisfying chore with smooth, automatic movements, while sharing the joys and grievances of the week with someone who knows exactly what were talking about, ready with cheers or sound advice or quiet contemplation. As we work and talk, we may throw the discarded stems onto a spread newspaper and drop the cool, green, snapped pieces with pale bean tips gleaming at the ends into the crockery bowls, with an occasional pause to fetch more beans or to drive home a point. Email us about postage costs for Canada or International orders. Peggy Willis Lyles was born in Summerville, South Carolina, on September 17, 1939. She died in Tucker, Georgia on September 3, 2010. A former Enlgish professor, she was a leading haiku writer for over 30 years—helping bring many readers and writers into the haiku community. Her voice and guidance will be missed in the community, but we know that her haiku will continue to touch so many souls in the future. Reading Cor van den Heuvels The Haiku Anthology, first edition, convinced her of the freshness, sparkle, and value of English-language haiku. Since the late 1970s her work was published regularly in leading journals in the United States and abroad. She received awards from Modern Haiku, Wind Chimes, Woodnotes, Mayfly,The Herons Nest, the Haiku Society of America, the Museum of Haiku Literature, Snapshot Press, the Mainichi Daily News, Japan Airlines, the New Zealand Poetry Society, the Suruga Baika Literary Festival, The Peoples Poetry Newsletter, Haiku Poets of Northern California, the World Haiku Club, and other publications and organizations. She judged competitions for the Haiku Society of America, the North Carolina Haiku Association, the Poetry Society of Georgia, the Tallahassee Writers Association, and other groups. Beginning with the September 2002 issue, Lyles was an associate editor of the on-line and print journal, The Herons Nest, and she served as a member of the editorial board for several of the most recent annual Red Moon Press anthologies. A long-term member of the Haiku Society of America and a founding member of Pinecone, the North Georgia Haiku Society, she read her poetry at Haiku Chicago 1995; the Global Haiku Festival, Millikin University 2000; and Haiku North America, Boston 2001; as well as in classrooms, bookstores, and clubrooms. From the Preface: Are you an old hand at English language haiku? Well-versed in its history and literature? Aware of the myriad debates about what makes a haiku a haiku? Or are you a relative newcomer to this unique form of expression, impressed by the way so few words convey so much vitality? Intuiting that there is much more to be discovered beneath the surface of words? 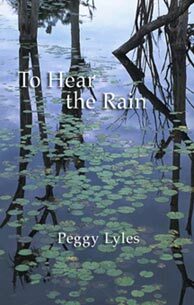 Experienced or not, I feel certain that youll be smitten by what you find in this magnificent collection, selected from among the many poems written by Peggy Willis Lyles during the past twenty-five years. So, forget what you know; dont worry about what you dont know. Simply immerse yourself in these vibrant moments.